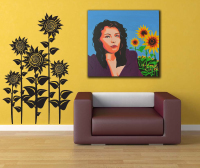 "The U" 36"x 36" Print of original Price: $75.00 My first trip abroad was to the Ukraine, where I met this beautiful woman and on the way from the airport, we passed a field of Sunflowers as far as the eye could see. I felt compelled to paint her picture when I picked up the brush after 25 years. 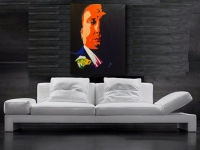 "Jesus Piece" 24"x 48" Print of original Price: $75.00 Just like J.J. on "Goodtimes", every Artist should do their interpretation of Jesus. 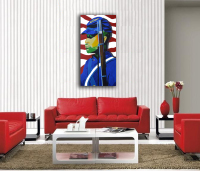 "Buffalo Soldier" 24"x 48" Print of original Price: $75.00 I’ve always had the utmost respect for the black regiments that fought for a country that once enslaved them, for a free future. "Keys" 36"x 48" Print of original Price: $100.00 The truth of the matter is, this is a painting covering a painting that I lost interest in. I’m glad I made this choice. "Motherland" 36"x 48" Print of original Price: $100.00 This painting is me ‘just messin’ around’, being creative. And I love it! 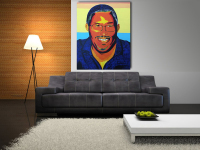 "Black Rage" 36"x 48" Print of original Price: $100.00 This painting was suggested by my BFF. 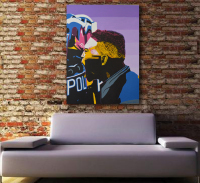 He said to me, "I know you like painting pictures of your girl but paint something relevant and look what is happening in the Baltimore riots!" This was the result. 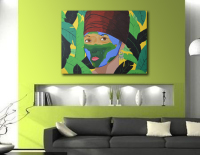 "Bonet-fied" 36"x 48" Print of original Price: $100.00 I told my son that I wanted to paint a picture of a “cutie”. He said to paint Zoe Kravitz, a new movie star of today...I chose her mother instead. 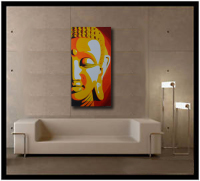 "Namaste" 24"x 48" Print of original Price: $75.00 The light within me, honors the light within you. "Method Man & RedMan" 24"x 36" Print of original Price: $50.00 each Their song the ‘Rockwilder’ always gets me pumped! "Baller for Life" 36"x 48" Print of original Price: $100.00 Basketball has always been my first love and no one showed as much love for the game as Magic. So this is my homage to him. And to all my ballers from the Clair. 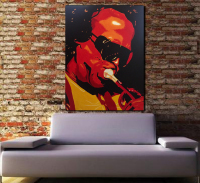 "Miles" 36"x 48" Print of original Price: $100.00 This is my first commissioned piece from my website, and happens to be my dads favorite Jazz musician. It turned out great! "T-Raj" 36"x 48" Print of original Price: $100.00 I wanted to paint something with a WOW factor for my live show at First Friday. So I chose this hot shot of Taraji. "Drive 88" 36"x 48" Original Acrylic on Canvas Price: $250.00 My son Jalen is a very talented artist and musician. 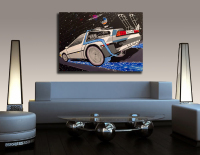 Please show your love and buy his painting, to encourage the younger generation in the Arts! 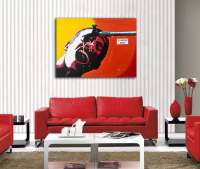 "Wes Montgomery" 36"x 48" Print of original Price: $100.00 This is my third commissioned piece from my website, and happens to be a part of a Jazz collection of paintings I have been commissioned to do. It turned out great! "Colored Water" 36"x 48" Print of original Price: $100.00 This painting was inspired by the crisis in Flint, Mich. I am still enraged inside by the way they treat people in lower income areas. We have to do better. 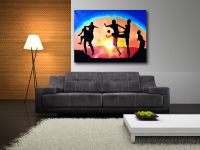 "From Dusk til Dawn" 36"x 48" Print of original Price: $100.00 This painting was a donation project for Hillside and Nishuane schools Fireball in the town I grew up in. Feels good to give back. 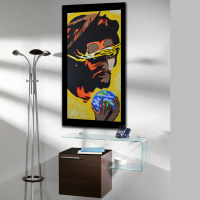 "All Power to the People" 24"x 48" Print of original Price: $75.00 This painting was inspired by the Superbowl halftime show that people were up in arms about! The Black Panther Party helped the black community in so many ways, so this is my tribute. 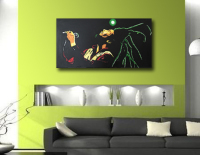 "One Love" 24"x 48" Print of original Price: $75.00 This painting was inspired by the great artistry and music by Bob Marley, who wanted to save the world by the way of music! 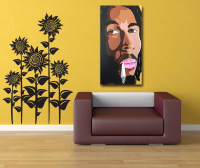 "Marley Joint" 24"x 48" Print of original Price: $75.00 This painting was inspired by the HBO show "Marley". 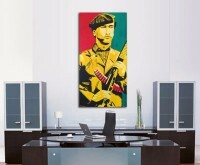 He was an extraordinary man, not just a Reggae musician. 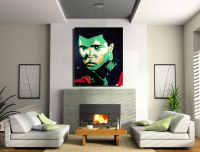 "Dearly Beloved" 36"x 48" Print of original Price: $100.00 This painting was inspired by the man himself, and I wanted to honor his great life and legacy ... Prince! "Warrior Princess" 36"x 48" Print of original Price: $100.00 This painting was inspired by the great artwork and artist in my gallery, the Red View Gallery, and the southwestern style. "Draw!" 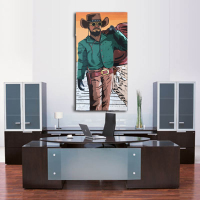 24"x 48" Print of original Price: $75.00 This painting was inspired by the southwestern art throughout Sedona, and the black pioneers that traveled west of the pecos. "Bounty Hunter Bass" 24"x 48" Print of original Price: $75.00 This painting was inspired by the southwestern art throughout Sedona, and the black pioneers that traveled west of the pecos. 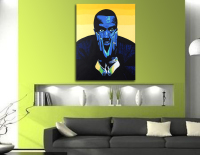 "Jesse Williams BET Speech" 36"x 48" Print of original Price: $100.00 This painting was inspired by Jesse Williams acceptance speech at the 2016 BET awards. He touched on race and economics and it was brilliant! 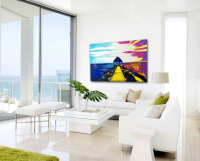 "Rawlie" 36"x 48" Print of original Price: Not for sale This painting was inspired by my Uncle (actually cousin) Lawrence Rawlins from Bermuda who's family had a great impact on my life. He passed away recently and this is how I wanted to remember him. 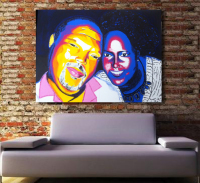 "Frank & Shannon" 36"x 48" Print of original Price: Not for sale This painting was inspired by one of my partners and his beautiful wife. This was my gift to them on their wedding day. "Ed Beckfor" 36"x 48" Print of original Price: Not for sale This painting was commissioned by one of my very good friends from Jersey. It turned out very cool! Go to Buy "The U"
Go to Buy "Buffalo Soldier"
Go to Buy "Black Rage"
Go to Buy "Jesus Piece"
Go to Buy "Method & Red"
Go to Buy "Baller for Life"
Go to Buy "The G.O.A.T." Go to Buy "Wes Montgomery"
Go to Buy "Colored Water"
Go to Buy "Sun Up til Sun Down "
Go to Buy "One Love"
Go to Buy "Marley joint"
Go to Buy "Storm is Brewin'"
Go to Buy "Power to the People"
Go to Buy "Dearly Beloved"
Go to Buy "Warrior Princess"
Go to Buy "Bounty Hunter Bass"
Go to Buy "Jesse Williams BET Speech"
Go to Buy "Personal Portrait"
Go to Buy "Drive 88"